Movie Review: From the acclaimed Georgian filmmaker, George Ovashvili, author of the masterpiece “The Other Bank”, comes the subtler but no less poignant “Corn Island”, another perspective of the hardships of survival in a piece of land shattered by the cruel war that opposes Abkhazians and Georgians. As explained during the first frames, the title comes from the fact that small islands are formed with rocks and dirt resulting from the annual spring flood of the Enguri River. These islands are blessings to the few local inhabitants who cultivate corn from spring to fall in order to subsist the extreme winter cold. The diligent direction of Mr. Ovashvili together with the astounding work of the Hungarian cinematographer Elemér Ragályi, facilitate closeness when we follow the arrival of an Abkhazian old man (Ilyas Salman) on one of these islands to build a shed and prepare the land for the crop. This is a big effort for his advanced age, but the man finds precious aid in his orphaned granddaughter (Mariam Buturishvili), a helpful, innocent teen who still holds a rag doll in their hands, but commence fearing the avid looks thrown by the soldiers who occasionally pass by boat or pop up in the shore. Uneasiness increases when the old man helps a wounded Georgian soldier (Irakli Samushia), hiding him from the sight of the officials from both factions. Despite the shots heard in the vicinity, the action is limited since the mood here is taken from the suspicion, apprehension, and tension of the soldiers’ visits and the sometimes ominous weather conditions that can spoil their chances of being succeeded. 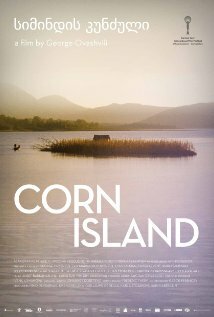 “Corn Island” was conceived in a slow yet detailed way, which suits a story of patience and dedication. Besides portraying a family legacy, the film is also an anti-war letter whose good and clear intentions make us ponder about the whole situation. Wringing sturdy performances, calibrated in terms of narrative, and enveloped by silences that speak volumes, this is another great film from an undeniably stylish filmmaker who keeps surprising.